PLUS! 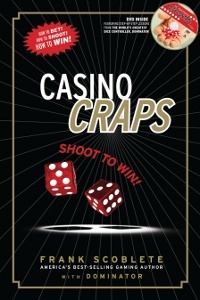 Casino Craps: Shoot to Win! comes with a Special DVD showing unedited controlled throws by Dominator, the world's greatest dice controller, with commentary by Frank Scoblete. PLUS! The true story of the greatest craps roll of all time! Join Frank Scoblete, Dominator and the Five Horseman as they take on Las Vegas! Casino Craps: Shoot to Win! can take you from a novice to a winner! If you want to beat the game of craps, this is the book for you - it has everything you need to know to get the edge over the casinos.